I had a great influx of views from Freshly Pressed and I answered all comments. What I didn’t know, is that once you “trash” a comment, it is then deleted on your site. I thought it was just deleted from your dashboard. So my apologies to all that didn’t see I acknowledged and thanked you. I greatly appreciate your support and visits. 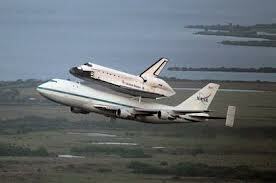 The Shuttle is Coming, The Shuttle is Coming! Now here’s the thing. According to the media this morning it was supposed to be flying over the area at 11:30. So it was an hour late. And I just didn’t think it was that special to wait an hour for. Maybe a rocket cause that has fire. Or if the shuttle itself was flying. But it was just like going to see a mom pushing a baby in a stroller or a Dad carrying a kid in one of those front-loaders. But then again I don’t get parades. If you want to see people walking and waiting on the sidewalk sell your car and ride public transportation. But that’s just me. Traffic was all stalled and a lot people were walking back from the beach, so I’m the 1%. Oh yeah, I also saw a headline in the local paper that read, “stock prices rise and riches return to America.” Wish I had some stock. I missed my usual Wednesday blog because of technical difficulties, so I wanted to do my random thoughts. It’s my version of water cooler chat, sending it out to the Universe. It’s my mom’s favorite. Do you think toasters are jealous of microwaves; they’re bigger, sleeker and faster? Why aren’t large trash bags large enough for the trash cans-they’re always folding in so you end up with garbage in the can itself? I don’t tell the weather with a trick knee, but because of the hair it does a great impression of Abraham Lincoln. I think there’s only three things that are actually 99 cents at the 99 cent store. Why can’t they just change the name, $1.59 is still good. While we’re on name changes, I think Two and a Half Men needs to change, that kids’ old. Wine is the classiest of drinks, yet it started with people stomping on grapes. Not so classy. You know what America needs: more chords. We don’t have enough things plugged in. Pizza should be served at every event. I have never met a person that doesn’t like pizza. Yes, please feel free to comment, I want to know why if you don’t like it. Why is math so hard to remember? I remember words and grammar and physics and perspective, but I couldn’t tell you what a cosine is. Does the sun ever just get tired? Agent Read reporting. I have infiltrated O’Hare International Airport on a reconnaissance mission to find out what people are reading in an attempt to assist all of us aspiring writers to know what is selling. So far I have seen two business books, Something Marketplace, but that is not our milieu. Three woman sat reading Us magazine. Something tells me they don’t belong to a book club. After ten minutes of how hilarious that is, I again attempt to ask my question. After such answers as ” I read my horoscope this morning”, “sport’s page” and “obituaries..to see if I was still alive” and endless laughter, it’s time to board the plane. I guess I will not have to wonder why 50 Shades of Gray is such a big seller and just write what’s in me. But it might be nice to just sleep on the plane.